How much is your personal data worth? Worth, as in – how much should you sell it for? In dollar terms. Imagine your friend has just told you about his new job. He now works for a company that pays people for their personal data. For example, you would tell the company your name and the name of your favorite TV show, and you would receive a certain amount of money in return. Your friend is in charge of setting fair prices for each piece of personal data. He needs advice from you about how much to pay. For each of the items below, please provide the price you believe would be fair to pay someone to provide that information. More methodology details are below, but let’s get straight to the results. In this table is each facet of personal data requested, and the survey respondents’ median1 dollar price value. People just don’t want to be bothered. Phone number and street address are the pieces of personal information held most dear. Employer and previous employer data are curiously highly-valued. 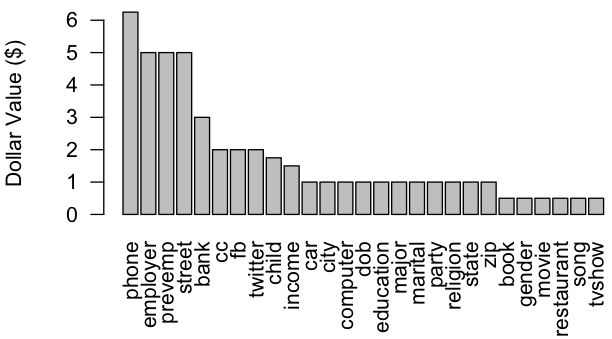 Twitter and Facebook identities are valued more highly than a number of demographic variables, including annual income. What Personal Data is it Inappropriate Even to Ask About? I wanted to make an option available to users to indicate that no price could ever persuade them to part with some data. The option I settled upon was a checkbox labeled “None / Inappropriate / Should Not Ask” that could be selected instead of entering a dollar value. In the table below, I list the personal data labels and the number of respondents who chose “None / Inappropriate / Should Not Ask” instead of entering a dollar value for the item. The ordering should look rather familiar. The median price ordering and the inappropriate to ask ordering are almost identical. The (Spearman) r-value for the correlation is 0.96. This suggests that the same personal data components that were given high dollar values (by respondents willing to affix a dollar value) were the same components that other respondents thought should be unavailable for sale at any price. I used Mechanical Turk to field a survey to 104 people. I limited the survey to users in the United States. Below is a partial screenshot that is exactly what the survey-takers saw when beginning the survey. The average time each survey-taker spent answering questions was just over four minutes. They gave a dollar value for the fair price or marked Inappropriate for 27 items. If you are interested in working with the raw fair price response data, please contact me and I will provide it. This survey should not be considered “scientific.” I did not attempt to obtain a random sample of the human population nor even the United States population. The sample is representative of those people using Amazon Mechanical Turk and willing to take a survey about the dollar value of personal data. How much of a limitation that is is up to you. I specifically asked users to provide “the price you believe would be fair to pay someone” for each item. I did not ask them what the price would have to be for them to sell their own data. I purposefully did this to reduce noise due to uniquely personal preferences in the data, but I recognize some might feel it better to ask the price question more directly. Because of the inevitable positive skew for these questions, the median is both nicer to look at and more representative of the actual distribution than the mean. One way to think about the median value in this context is that of the people surveyed 50% would accept this value as a fair price. It meets or exceeds their asking price. This entry was posted in research and tagged advertising, facebook, internet, marketing, privacy, twitter on October 18, 2012 by shotgunapproach.